As mentioned in last Tuesday's post, Miles Austin has been a brick wall ancestor of my hubby's for quite a while. One of my new Austin contacts had found information about a second marriage for Miles and brought it to my attention. It was found on Familysearch and because there was no indication of exactly where this information came from I was skeptical. Luckily my other new Austin contact was able to get a hold of the copy of the original marriage certificate. Place of Wife's Birth, Rockingham Co. N. C.
Place of Wife's Residence, Wythe Co. 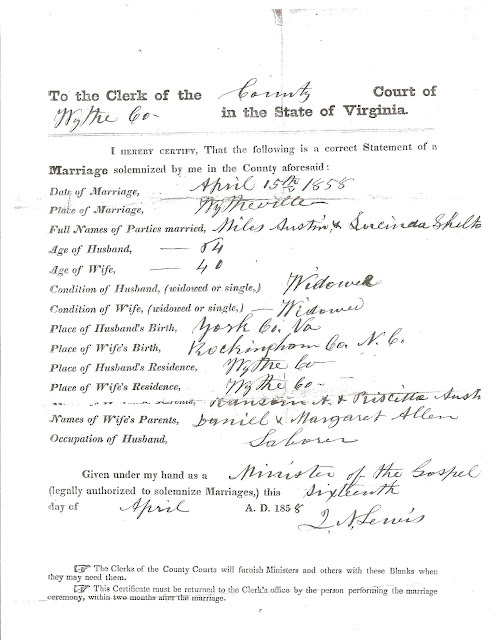 The awesome thing about this marriage certificate is that we learned the names of Miles' parents. At the same time this certificate brings us more questions to answer. Why such a short lived marriage and how short was it? Inquiring minds want to know! I spoke with a researcher John Clinard of the AFaOA the other day. He said the Lucinda also died and he was a widower again. back a ways as well as the Sheltons.